Since many of us still have our good ol' Samsung Galaxy S devices, and it's a well known fact that Samsung will no longer be providing us support, I figured I'd post my cumulative knowledge here in a sort of how-to guide in case anyone else wants to take the plunge into the world of custom ROMs for their SGS as well. The information below is specific to our Canadian version of the phone, sold by Bell and Virgin, the GT-i9000M. I know there are easier ways, namely with Darky's Recovery ROM's, to get to the same end result, but I'd rather use stock GT-i9000M files just in case they're different from the GT-i9000 counterpart. Our model does have 16GB of memory compared to the 8GB found in some GT-i9000s. Download the latest CM9 or CM10 Nightly. CM9 = Ice Cream Sandwich; CM10 = Jellybean. Download the latest Google Apps. Make sure you pick the right one! For CM9/ICS: gapps-ics-20120429-signed.zip; for CM10/JB: gapps-jb-20121011-signed.zip. If you are not currently rooted, skip to Phase 2B. I strongly recommend using Titanium Backup to backup all your apps. If you need to backup your SMS's, there's a ton of apps on the Play Store that should be able to do this. I've never cared enough to try though. Once you've backed up your apps, copy all your internal SD card contents to your computer. We shouldn't need to format the internal SD, but better safe than sorry. I would recommend removing your external SD card at this point as well if you have one. Assuming you are running the latest Bell ROM (UGKG3), which should be found in Settings>System>About Phone, continue this phase. If you are not on the latest Bell ROM, please upgrade accordingly using Kies or follow Phase R.
Power off the phone and disconnect the USB cable. Hold VolDown + Home while pressing the Power. It should boot into "Download Mode". Connect the USB cable to your computer and wait for the drivers to install. Open "Odin3 v1.85.exe" and make sure you see a COM port active (in yellow). Setup Odin to match the below screenshot. Then click Start. Your phone will reboot once complete. It should now be rooted with CWM support. You should find 3 new apps installed: Superuser, CWM, and Tweaks. 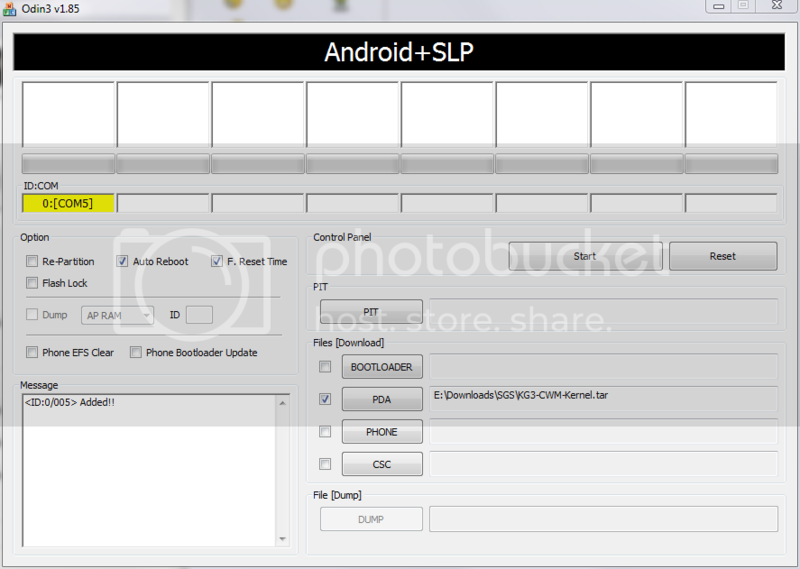 Select "Su binary v3.0 Tap to check for updates"
Now that you have CWM, you can proceed with flashing CM9. Connect your phone to your PC and copy over "update-cm-9-xxxx-NIGHTLY-galaxysmtd-signed.zip" and "gapps-ics-xxxx-signed.zip"
Open the CWM app and select "Reboot into ClockWordMod recovery"
Using the volume keys to scroll and the power key to select, chose "install zip from sdcard"
Select "Yes - " and patiently await for your phone to boot into ICS. To ensure everything flashed properly, I usually do it one more time. If you chose not to do a wipe above, you'll need to first reboot into recovery before continuing these steps. Once complete, select "+++++Go Back+++++" and "reboot system"
...and now you should be running ICS! 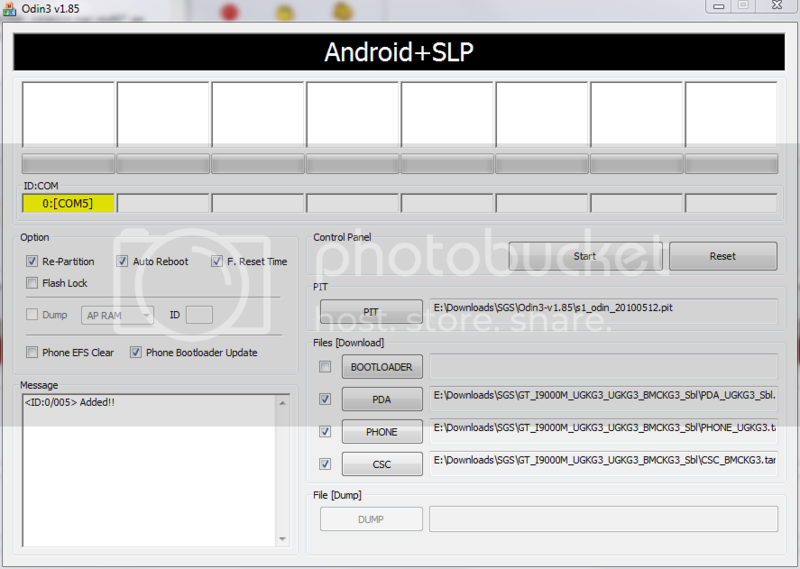 Note: If you are upgrading from CM9, you must wipe data/factory reset prior to flashing CM10. Now that you have CWM, you can proceed with flashing CM10. Connect your phone to your PC and copy over "update-cm-10-xxxx-NIGHTLY-galaxysmtd-signed.zip" and "gapps-jb-xxxx-signed.zip"
Select "Yes - " and patiently await for your phone to boot into JB. ...and now you should be running Jellybean! Last edited by JD; October 28, 2012 at 06:55 PM. Although upon flashing CM9, it will give you a modem which will likely have reception, it may not be ideally suited for our phones. From the Google Drive link in the first post, there's a folder containing my collection of modems with support for the 850MHz band which we have in Canada. It's key that your phone is disconnected when flashing. Some have reported a loss of signal entirely if they flash while connected. I've personally never experienced that, but better safe than sorry! If everything goes wrong, or you simply want to blow away everything on your phone, continue here. I would personally recommend doing this, especially if your coming from other ROMs that may have flashed GT-i9000 bootloaders instead of GT-i9000M bootloaders. It likely isn't a big deal, but I cannot say for certain. If your phone powers up with a splash screen showing only "GT-i9000", then you have the wrong bootloader. Power off your phone, remove external SD, disconnect USB. Hold VolDown + Home while pressing Power. It should boot to a "Downloading..." screen. Connect USB to PC. Windows should then install some drivers. Open "Odin3 v1.85.exe" and make sure you see a COM port active (in yellow). Configure Odin to match the below screenshot. Then click Start. Sit back and relax until your phone reboots. You should now be at a clean ROM, exactly as you'd receive the phone from Bell. I would recommend following Phase 2B at this point to gain root access and CWM. Last edited by JD; October 28, 2012 at 06:42 PM. One could easily go to XDA or Cyanogen's site.... No need for this thread. I find xda a friggen nightmare to find stuff, it's all an unorganized pile of mess with threads that are 500 pages long. It stressed me out way more than finding out how to root my phone. I hate using XDA, i prefer forums with a straight to the point thread. XDA is a nightmare to try to navigate and find what you're looking for. Currently I'm running the latest nightly build for the i9000. The only issue I've found is if you are with Bell, the default modem will not work (bell likes using different frequencies). So far I've found the JW4 modem works alright, though on my drive home yesterday I lost reception twice going from Saint John to Fredericton (never happened before). I'm going to try the KG3 modem, people have reported the best luck with it and I'll let the rest of you Bell guys know how it works for me. I know XDA has countless threads, but as said, it's impossible to really find a concise guide. And most of them are for the GT-i9000, so you inadvertently end up with GT-i9000 bootloaders. UGKG3 is the best modem in Canada. XDA may be a mess... And the forums there are a joke, but I still found it pretty easy to use. I'm going to try out JL2 and see how that reception is driving and in my basement apartment. KG3 had rather poor basement reception last night too so we'll see.